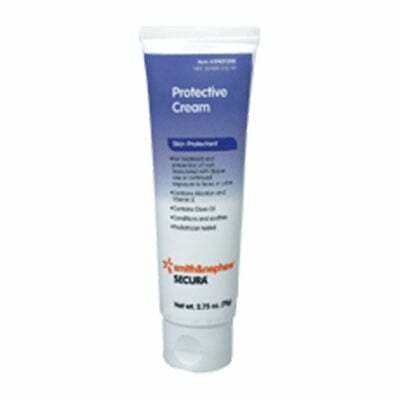 Smith and Nephew Secura Protective Cream, 2.75 oz Tube, REF # 59431200. This is a top quality wound care product by Smith and Nephew, Inc. ADW Diabetes has a wide range of these and other wound care supplies at great prices. Indications: Skin protectant. Helps treat and prevent rash associated with diaper use or continued exposure to feces, urine or both. Protects skin from minor irritation associated with diaper dermatitis and exposure to feces and urine, and helps seal out wetness. Warnings:For external use only. Avoid contact with eyes. Not to be applied over deep or puncture wounds, infections or lacerations. If condition worsens or does not improve within 7 days, consult a doctor. Keep this and all drugs out of the reach of children. In case of accidental ingestion, seek professional assistance or contact a Poison Control Center immediately. Please review the size, style, and quantity carefully before ordering. If you have any questions about this wound care item or any other products from Smith and Nephew, Inc. please call our customer care specialists toll free at 877-241-9002.